Preto, B. L., Kimpara, J. M., Valenti, P. M., Rosa, F. R. T. & Valenti, W. C. Production strategies for short term grow-out of the Amazon River prawn Macrobrachium amazonicum (Heller 1862) in ponds. Pan-American Journal of Aquatic Sciences, 6(1): 1-8. Download PDF file (339 Kb). Brauko, K. M., Camargo, M. G. & Lana, P. C. A new method to assess herbivory levels on Rhizophora mangle L. fruits in mangroves with different degrees of forest complexity. 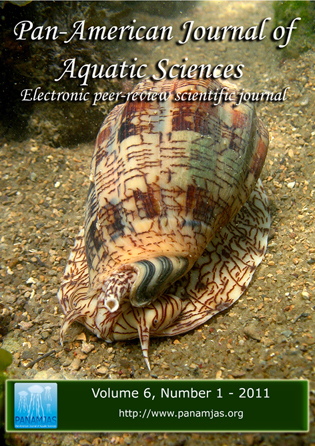 Pan-American Journal of Aquatic Sciences, 6(1): 9-15. Download PDF file (310 Kb). Brand�o, M. C., Stumpf, L., Macedo-Soares, L. C. P. & Freire, A. S. Spatial and temporal distribution of brachyuran crab larvae in Ibiraquera Lagoon, southern Brazil. Pan-American Journal of Aquatic Sciences, 6(1): 16-27. Download PDF file (581 Kb). Cardozo, A. P., Britto, V. O. & Odebrecht, C. Temporal variability of plankton and nutrients in shrimp culture ponds vs. adjacent estuarine water. Pan-American Journal of Aquatic Sciences, 6(1): 28-43. Download PDF file (222 Kb). Uwadiae, R. E., Okunade, G. O. & Okosun, A. O. Community structure, biomass and density of benthic phytomacrofauna communities in a tropical lagoon infested by water hyacinth (Eichhornia crassipes). Pan-American Journal of Aquatic Sciences, 6(1): 44-56. Download PDF file (611 Kb). Silva, F. L., Pauleto, G. M., Ruiz, S. S. & Talamoni, J. L. B. Aquatic macroinvertebrates survey and assessment of two artificial reservoirs into conservation units from the Southeast Region of Brazil. Pan-American Journal of Aquatic Sciences, 6(1): 57-64. Download PDF file (534 Kb). Tozetti, A. M., Fontana, C. S., Oliveira, R. B. & Pontes, G. M. F. Diet of a Maguari Stork (Ciconia maguari, Aves, Ciconiidae) in southern Brazil: the opportunist predation of snake like preys?. Pan-American Journal of Aquatic Sciences, 6(1): 65-67. Download PDF file (124 Kb). Bezerra, N. P. A., Travassos, P., Viana, L. V. & Macena, M. C. L. Occurrence of blackfin tuna Thunnus atlanticus) Lesson 1931 (Scombridae) in Saint Peter and Saint Paul Archipelago, Brazil. Pan-American Journal of Aquatic Sciences, 6(1): 68-70. Download PDF file (180 Kb). Zarucki, M., Gonz�lez-Bergonzoni, I., Teixeira-de Mello, F. & Loureiro, M. Fish diversity loss in an urban stream of Uruguay throughout the last century. Pan-American Journal of Aquatic Sciences, 6(1): 71-75. Download PDF file (384 Kb). Martin�z-Porchas, M., Hern�ndez-Rodr�guez, M., D�vila-Ortiz, J., Villa-Cruz, V. & Ramos Enr�quez, J. R. A preliminary study about the effect of benzo[a]pyrene (BaP) injection on the thermal behavior and plasmatic parameters of Nile tilapia (Oreochromis niloticus L.) acclimated to different temperatures. Pan-American Journal of Aquatic Sciences, 6(1): 76-85. Download PDF file (416 Kb).